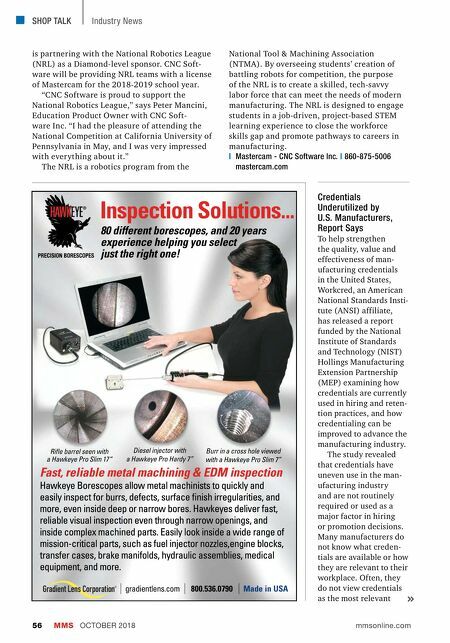 SHOP TALK MMS OCTOBER 2018 56 mmsonline.com Industry News is partnering with the National Robotics League (NRL) as a Diamond-level sponsor. CNC Soft- ware will be providing NRL teams with a license of Mastercam for the 2018-2019 school year. "CNC Software is proud to support the National Robotics League," says Peter Mancini, Education Product Owner with CNC Soft- ware Inc. "I had the pleasure of attending the National Competition at California University of Pennsylvania in May, and I was ver y impressed with ever ything about it." 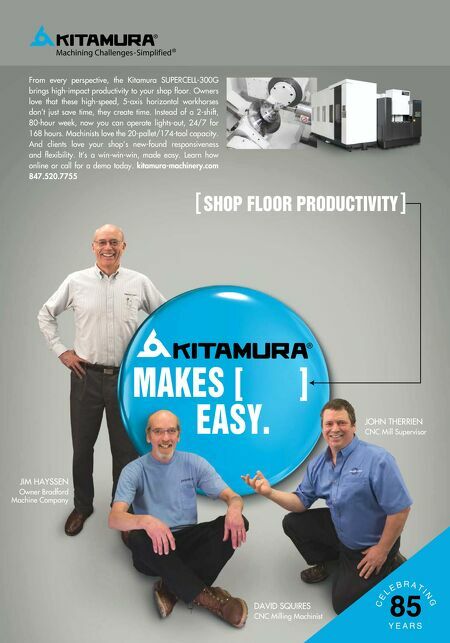 The NRL is a robotics program from the National Tool & Machining Association (NTMA). By overseeing students' creation of battling robots for competition, the purpose of the NRL is to create a skilled, tech-savvy labor force that can meet the needs of modern manufacturing. The NRL is designed to engage students in a job-driven, project-based STEM learning experience to close the workforce skills gap and promote pathways to careers in manufacturing. | Mastercam - CNC Software Inc. | 860-875-5006 mastercam.com Credentials Underutilized by U.S. Manufacturers, Report Says To help strengthen the quality, value and effectiveness of man- ufacturing credentials in the United States, Workcred, an American National Standards Insti- tute (ANSI) affiliate, has released a report funded by the National Institute of Standards and Technology (NIST) Hollings Manufacturing Extension Partnership (MEP) examining how credentials are currently used in hiring and reten- tion practices, and how credentialing can be improved to advance the manufacturing industry. The study revealed that credentials have uneven use in the man- ufacturing industry and are not routinely required or used as a major factor in hiring or promotion decisions. Many manufacturers do not know what creden- tials are available or how they are relevant to their workplace. Often, they do not view credentials as the most relevant Rifle barrel seen with a Hawkeye Pro Slim 17" Diesel injector with a Hawkeye Pro Hardy 7" Burr in a cross hole viewed with a Hawkeye Pro Slim 7" Fast, reliable metal machining & EDM inspection Hawkeye Borescopes allow metal machinists to quickly and easily inspect for burrs, defects, surface finish irregularities, and more, even inside deep or narrow bores. Hawkeyes deliver fast, reliable visual inspection even through narrow openings, and inside complex machined parts. Easily look inside a wide range of mission-critical parts, such as fuel injector nozzles,engine blocks, transfer cases, brake manifolds, hydraulic assemblies, medical equipment, and more. gradientlens.com 800.536.0790 Made in USA Inspection Solutions... 80 different borescopes, and 20 years experience helping you select just the right one!